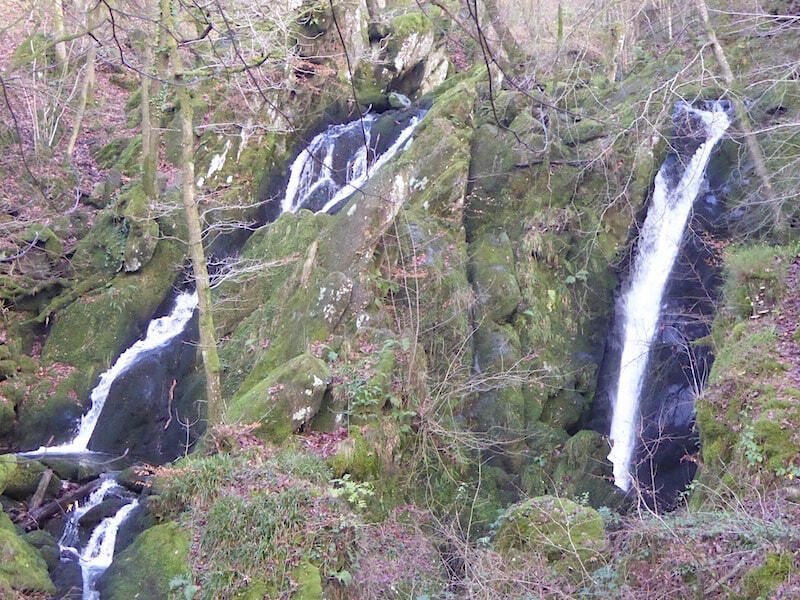 We’re in Ambleside today for a walk up Wansfell Pike via Stockghyll Force. 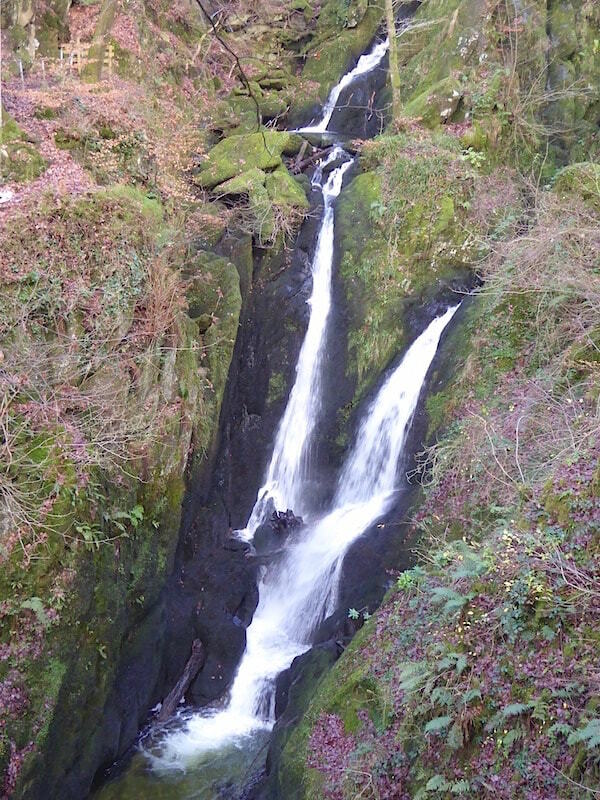 In all the many visits we’ve made to Ambleside we have never visited the waterfalls so we decided to put that right today. As usual the town was busy and we threaded our way through the crowds and up the hill to find the path. 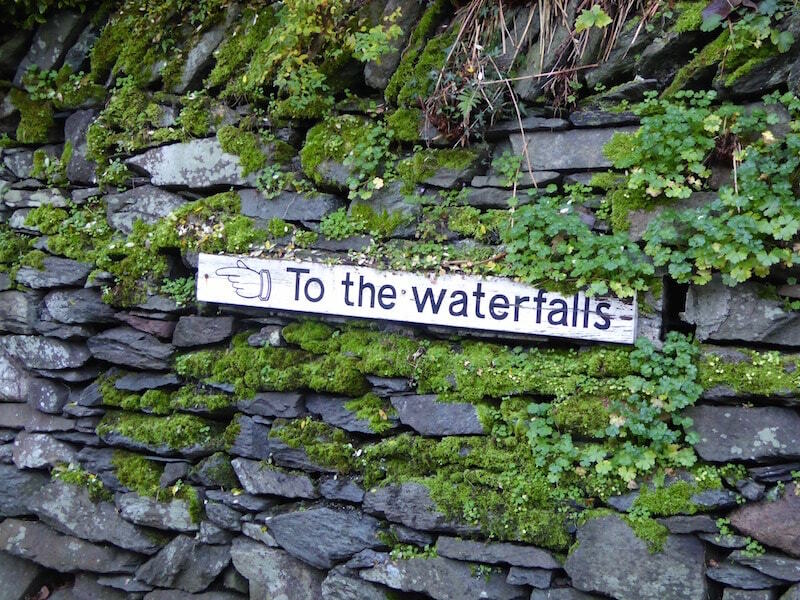 We are very good at missing the beginning of paths, usually because we’re talking and not paying enough attention, but the good folk of Ambleside have realised that some visitors will inevitably go astray and have kindly provided notices to point them in the right direction. Even we can’t miss this and end up in someone’s back garden or farmyard. They have even provided a second one just to reassure you that you are still heading in the right direction. 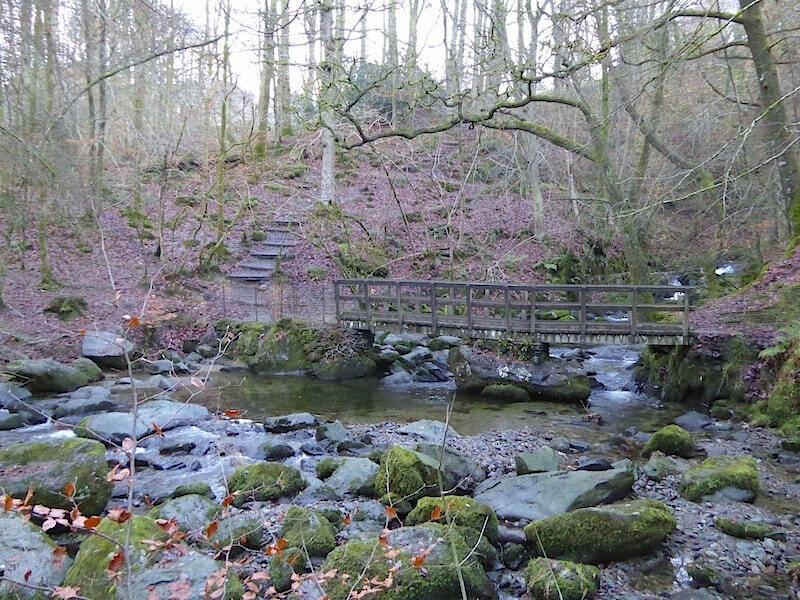 The main path goes over this little bridge …..
….. but we took a lower path to take a little look around. Its difficult to get really close to the falls, as you can see, so I had to make do with doing a close up shot, The light at this point wasn’t very good so I’ll have another go on the return leg when things should be a little brighter. 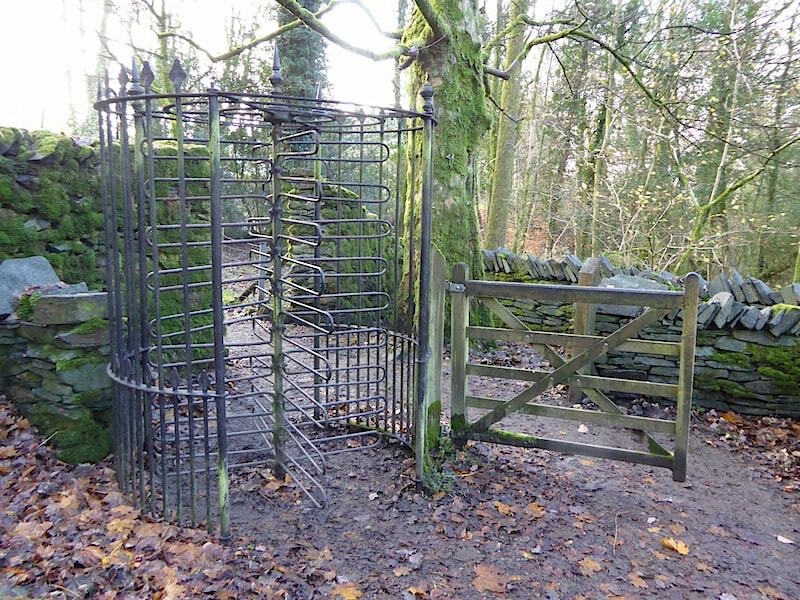 At the top of the path is this old revolving gate out on to the lane beyond. Naturally we went through it. 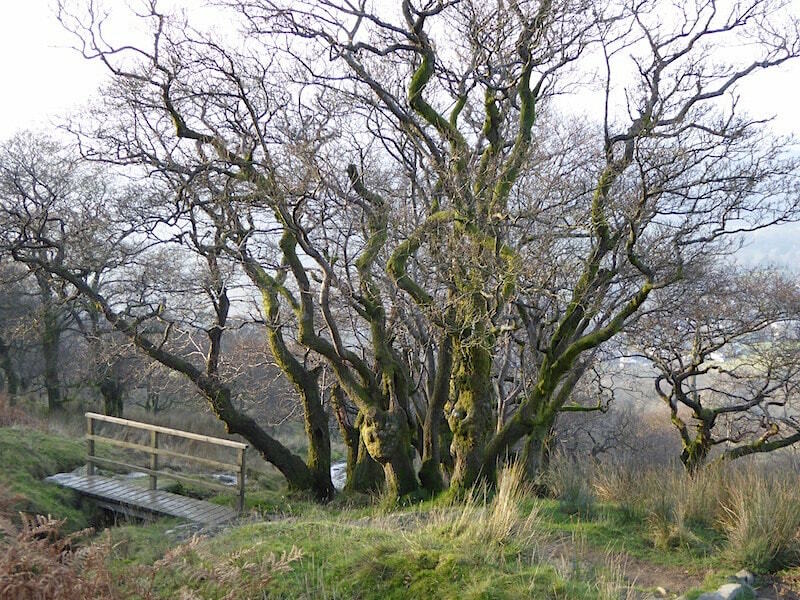 We could just as easily have walked through the wooden one but where’s the fun in that? 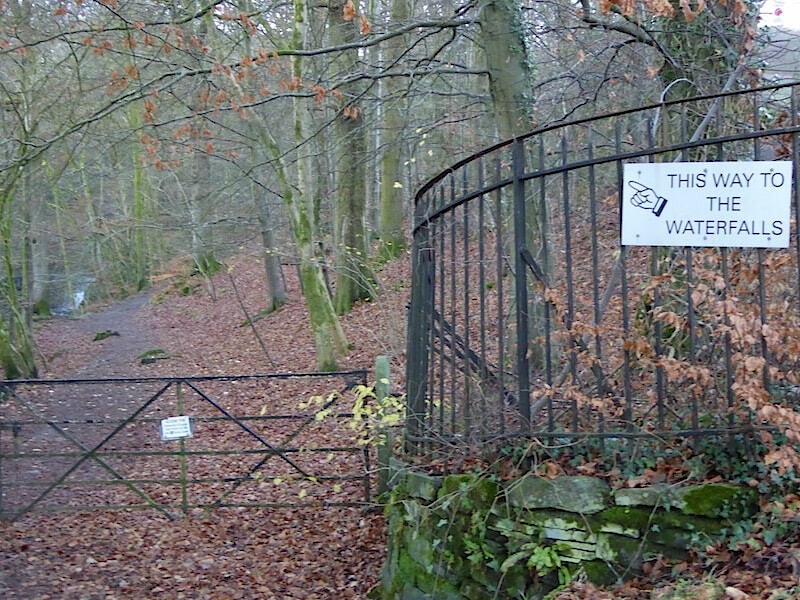 If you are wondering why there is a revolving gate here at all its because in the Victorian era there was a one penny charge to walk through the woods and visit the falls, which presumably was paid at the other end of the path. Visitors who had paid could exit the walk via the revolving gate, and, as it revolves anti-clockwise only, it would prevent others trying to get in for nothing. Will you stop waffling on about gates so we can get on with the walk please! Once through the gate and onto the lane we turn left and walk a short distance along the lane until we reach the start of the path going up to Wansfell Pike. It was getting warm now and the jackets were already off and stowed in the rucksacks. 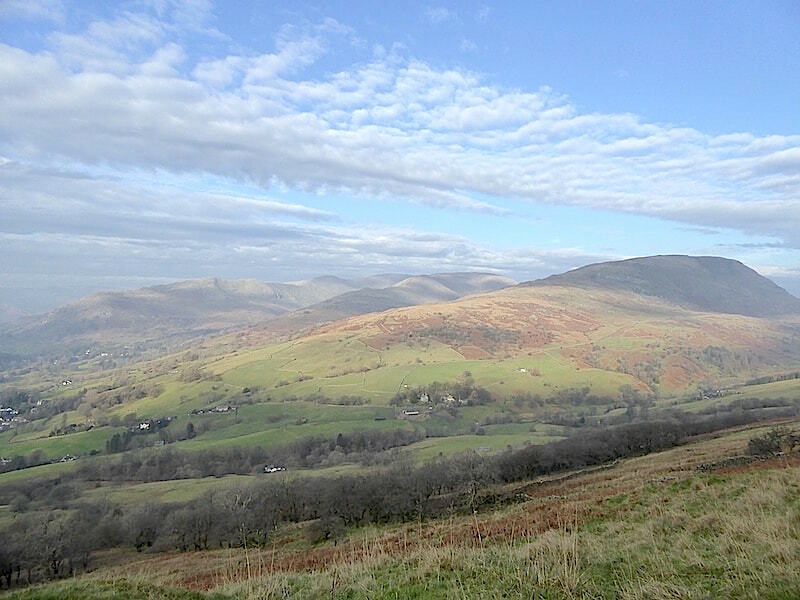 From a little way up the path here’s a view of Ambleside and the lower end of Nab Scar on the right. 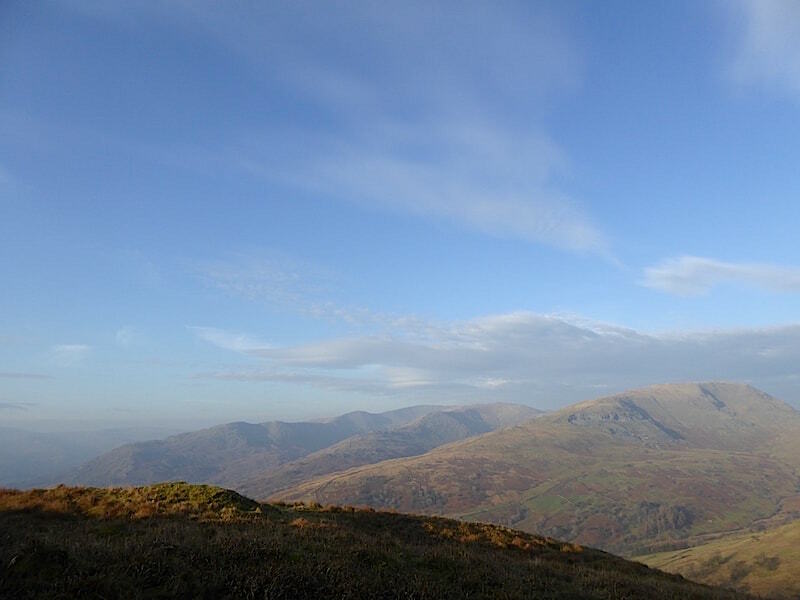 A triple layer of fells – Red Screes in front, behind that are Low Pike and High Pike, and behind them are Nab Scar, Heron Pike and Great Rigg. 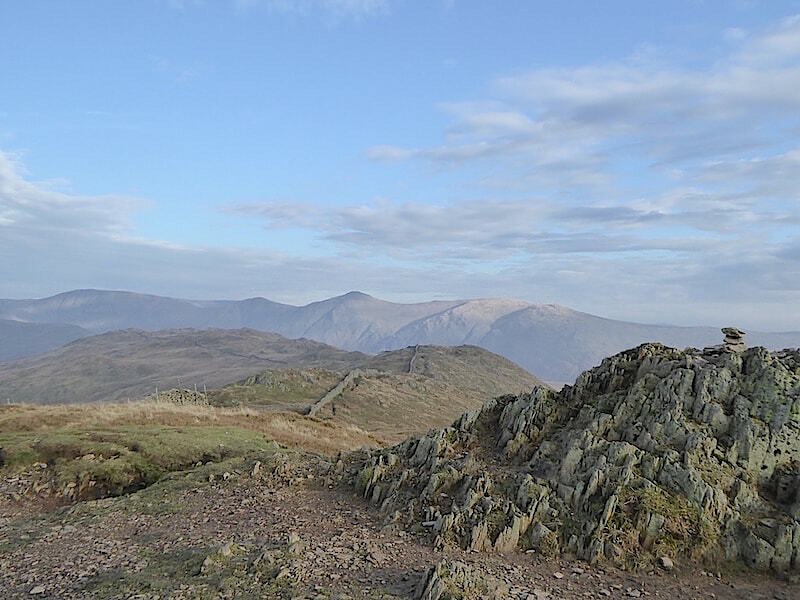 Red Screes stands alone, but the others meet up at Fairfield and form the Fairfield Horseshoe. 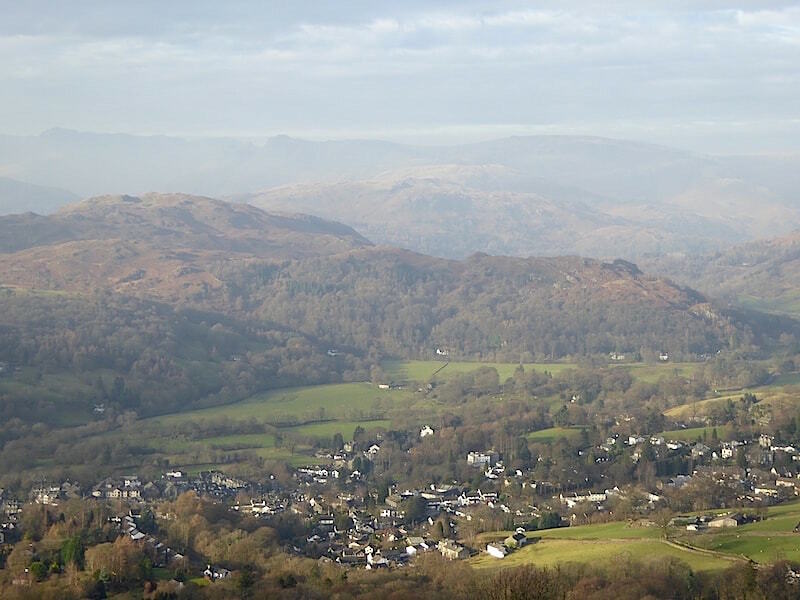 Ambleside again with Loughrigg behind. It must have been bell ringing practice at the church as we heard them for half an hour as we climbed. Around this point we had another stop to remove the next layer, and we’re now down to short sleeves and sweating heavily. The air was very still and warm and humid, with nothing to cool you down. 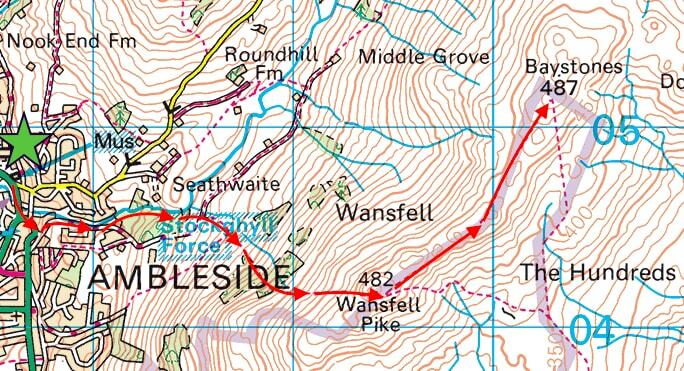 We were on the west side of Wansfell and so weren’t getting any of the mild south easterly breeze. There were lots of people walking up here all of them gradually removing layers of clothing as the heat increased and the path got steeper, and everyone commenting on how warm it was for the end of November. There were days during the summer when it wasn’t as hot as it was today. 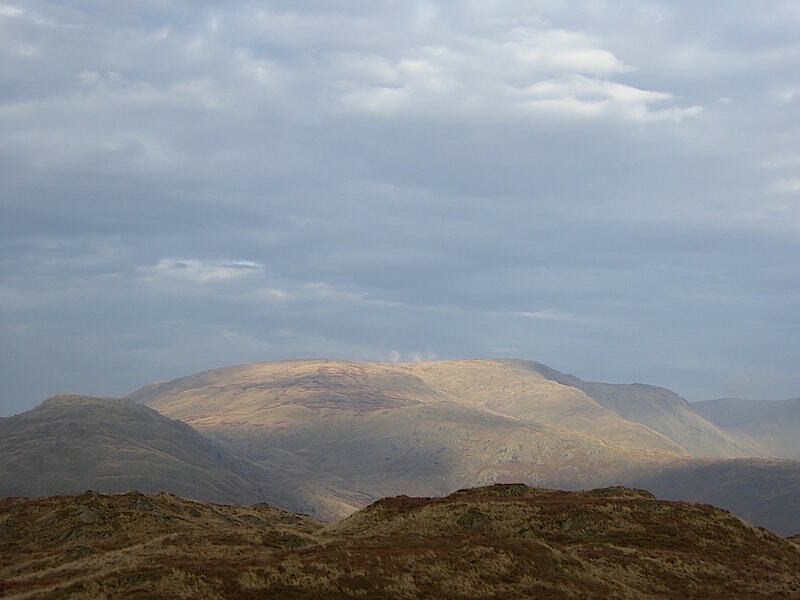 The Fairfield Horseshoe in full view behind Red Screes. 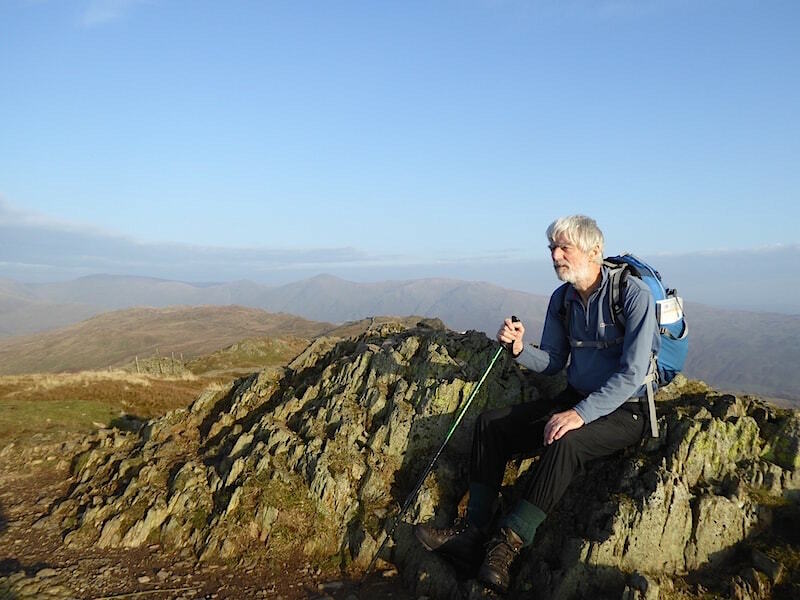 Starting over on the far left and walking clockwise you would climb Nab Scar, Heron Pike, Great Rigg and over to Fairfield at the head of the horseshoe. 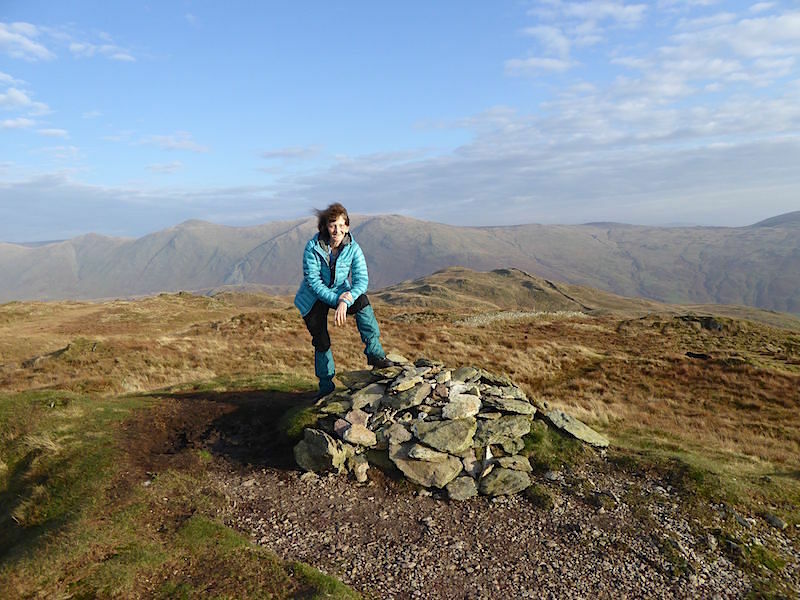 From Fairfield you return down to Hart Crag, Dove Crag, High Pike and Low Pike. Of course you don’t have to walk it that way round, anti clockwise is just as good. 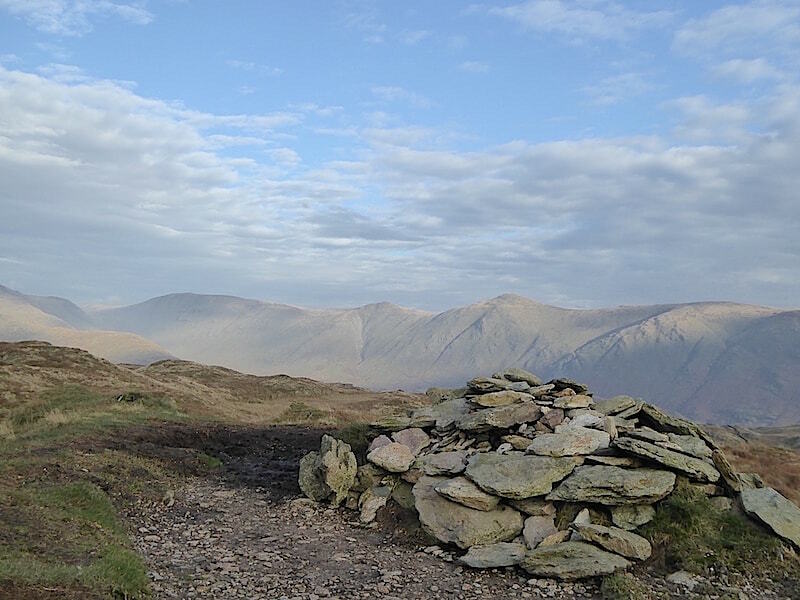 Either way you can have a grand day out and visit eight Wainwright fells at the same time. Nobody is waiting at either start point to charge you a penny to do it either, its all free apart from the energy you spend and the car parking charges in Ambleside. 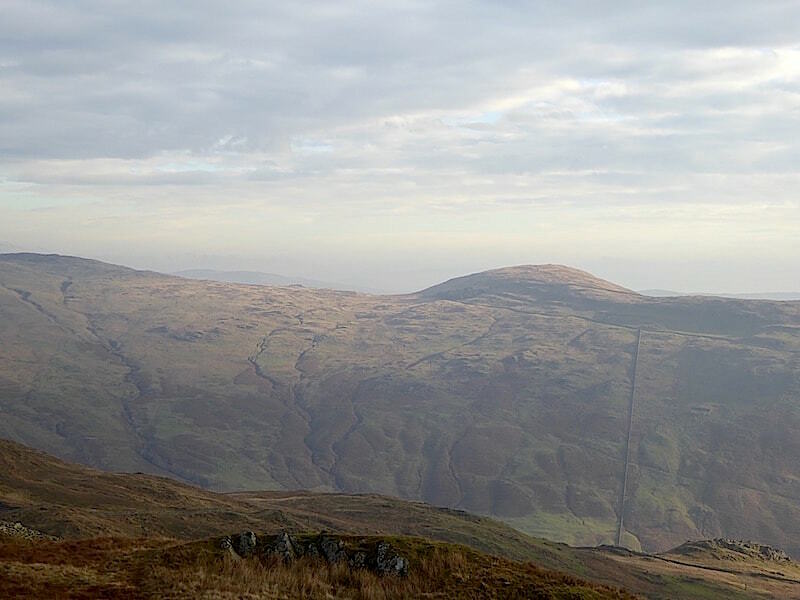 Looking up towards Wansfell Pike, and although it may not look it, it is quite a steep path. Its not a walk in the park by any means, especially on a hot day in November wearing winter weight trousers and carrying a bag full of winter gear, none of which turned out to be needed today. You could have got away with shorts and a t-shirt. 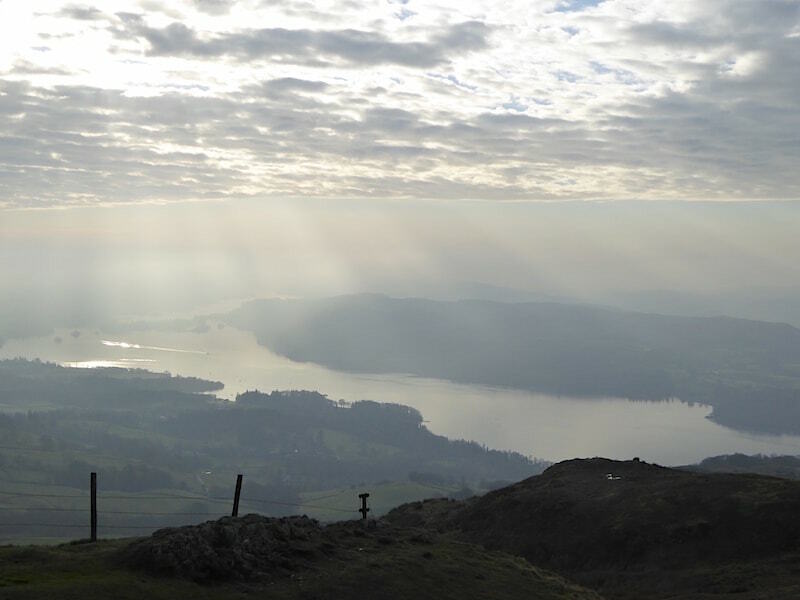 Slivers of silver on Windermere as the sunlight found its way through the broken cloud. Its difficult to get a good picture of Windermere from here as we’re facing south and the merest hint of sun will always make things difficult. 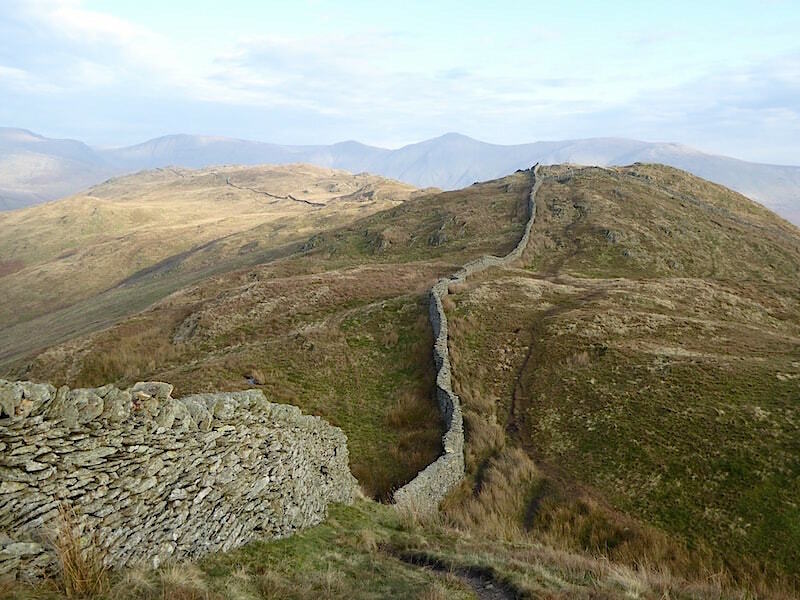 No such problems looking the other way along the ridge from Wansfell Pike towards Baystones. 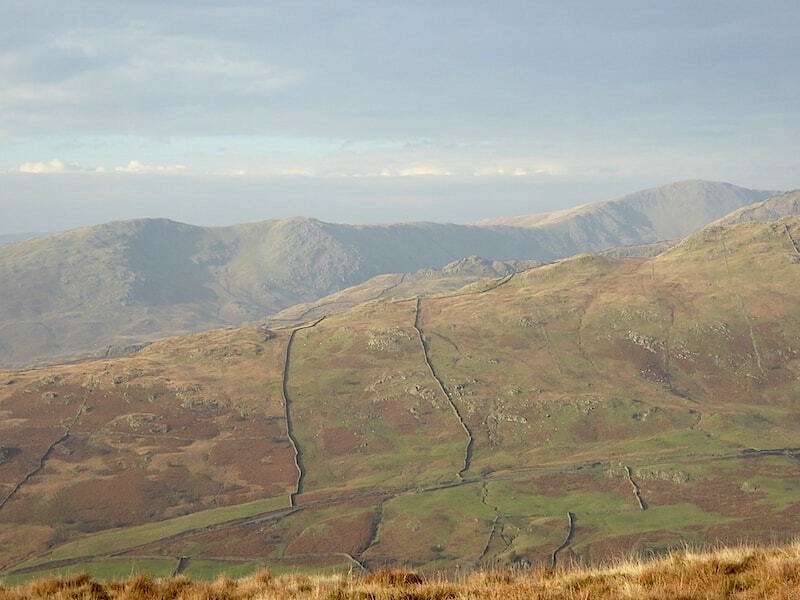 On the skyline are Thornthwaite Crag, Froswick, Ill Bell and Yoke, which form the western section of the Kentmere Horseshoe. 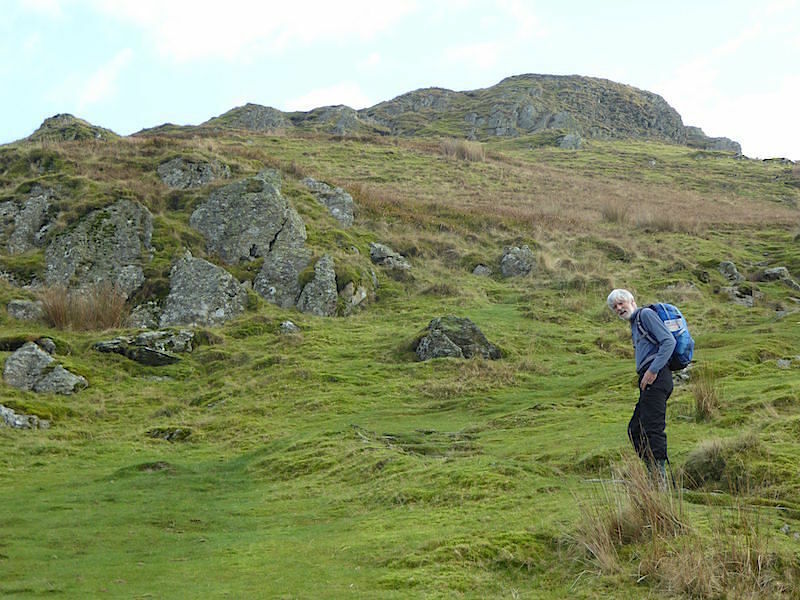 Time to move on across to the summit of Wansfell, named Baystones, and a very soggy walk it turned out to be. At least we were now feeling the light breeze and could cool down a little. Despite the very wet ground we made it to the cairn on Baystones with dry feet. 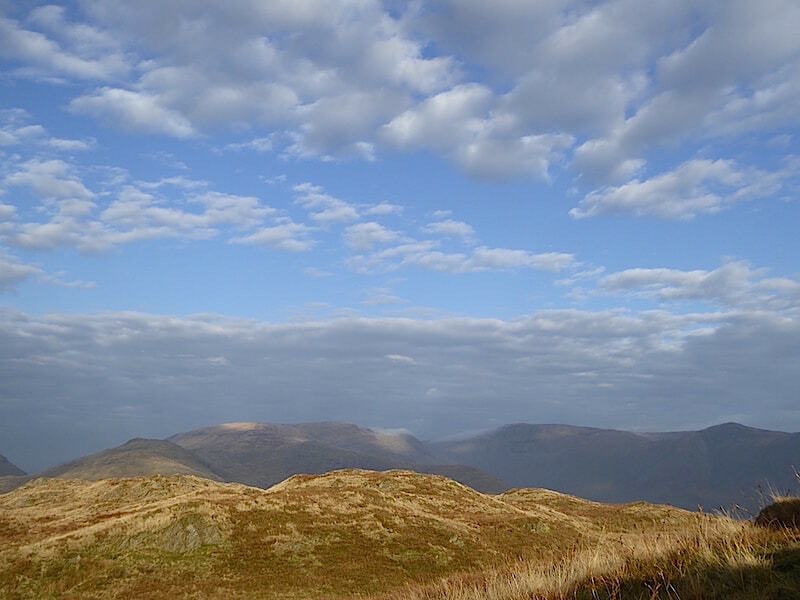 Here we had a good view of the western half of the Kentmere Horseshoe. 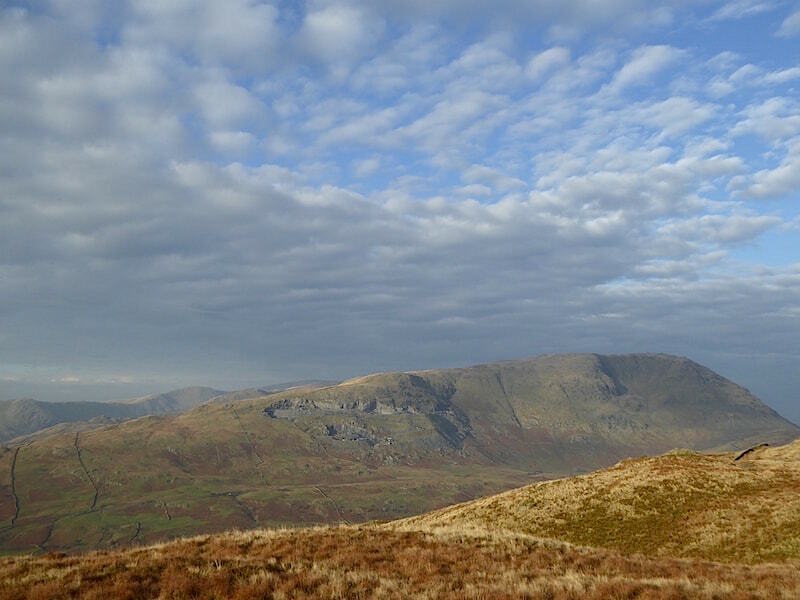 Looking across towards Caudale Moor and Stony Cove Pike from Baystones. A close up of Red Screes.The little white specks at the bottom of the shot are vans and cars making their way along the Kirkstone Pass. The rounded hump on the skyline is Sallows. 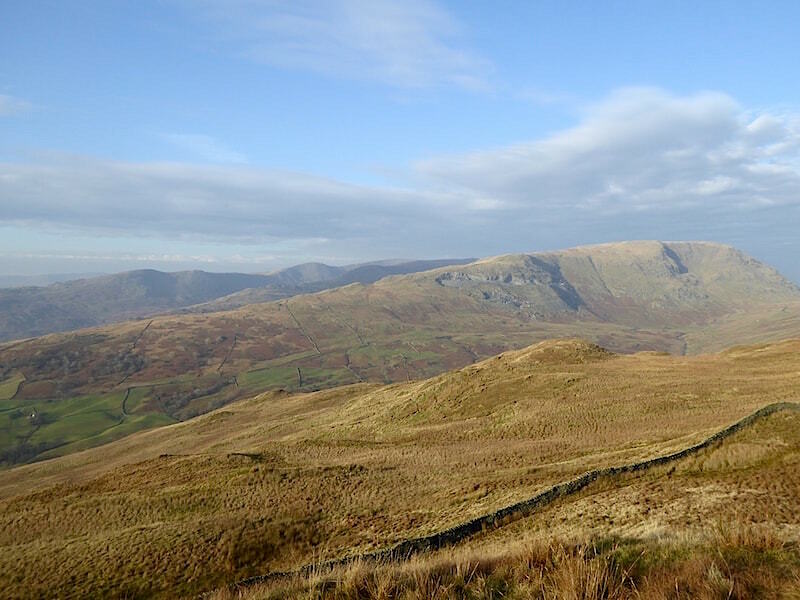 Looking back to Wansfell Pike from Baystones. It was a trying time walking back along here as everything was in deep shade and you couldn’t tell whether the dark patch you were stepping into was simply a shadow or a pool of water. 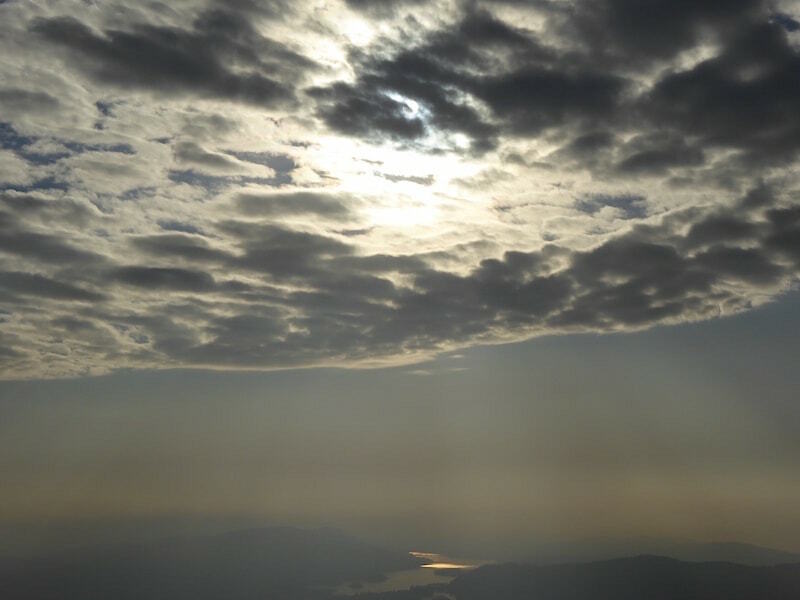 Those clouds look more ominous than they really were and Windermere has a golden glow across it. Looking the other way gives you a better idea of what the clouds and the day were really like, just fantastic for this time of year. 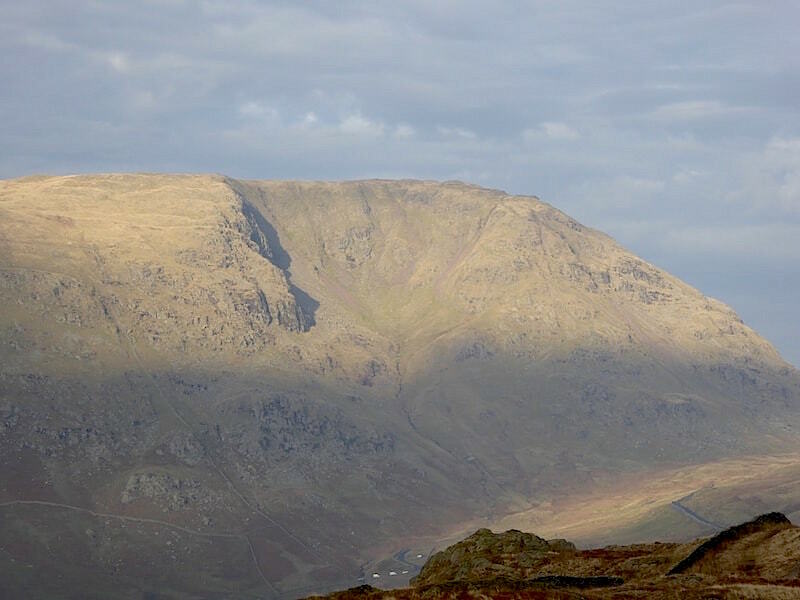 Across from us is Red Screes and the quarry area along its flanks. 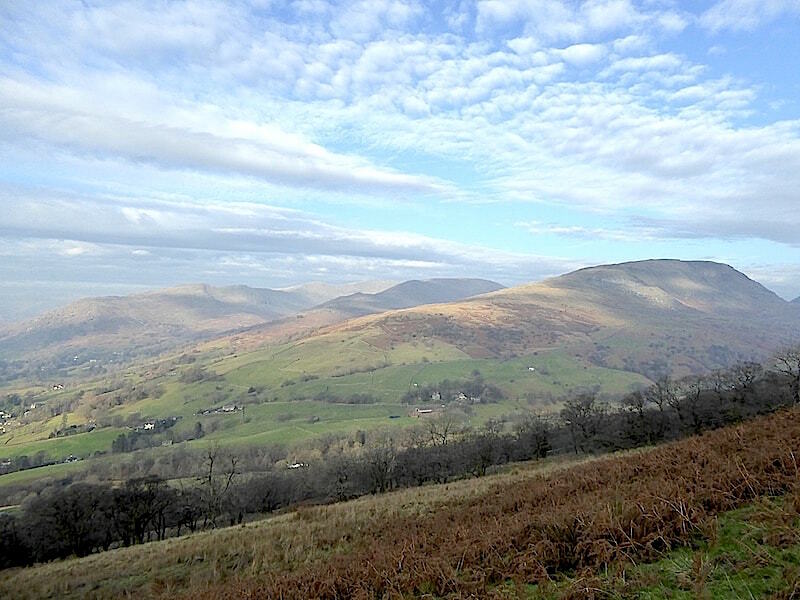 Looking north towards Threshthwaite Mouth, which is the U-shaped dip in the skyline. 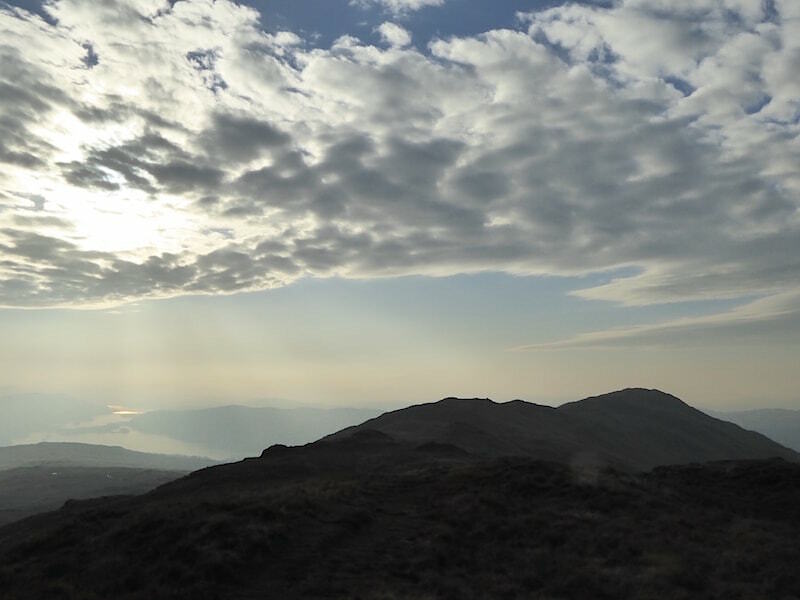 Looking west again over the lower end of Red Screes. Low Pike is the little rocky area sandwiched in the middle, with the Nab Scar, Heron Pike and Great Rigg ridge behind it. Enjoying the breeze on Baystones. The cloud drifted away and we are now enjoying the warm sunshine. Lovely to have the blue sky back again. 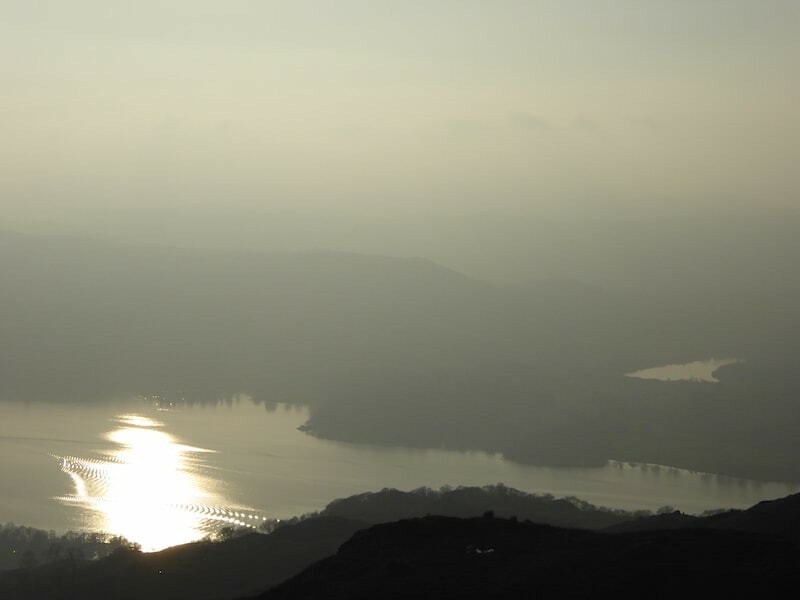 By way of contrast, back at Wansfell Pike the murk over Windermere was even gloomier, but there was a nice sheen on the lake though. We take a short break and watch another crowd of people coming through the gate on the Pike. 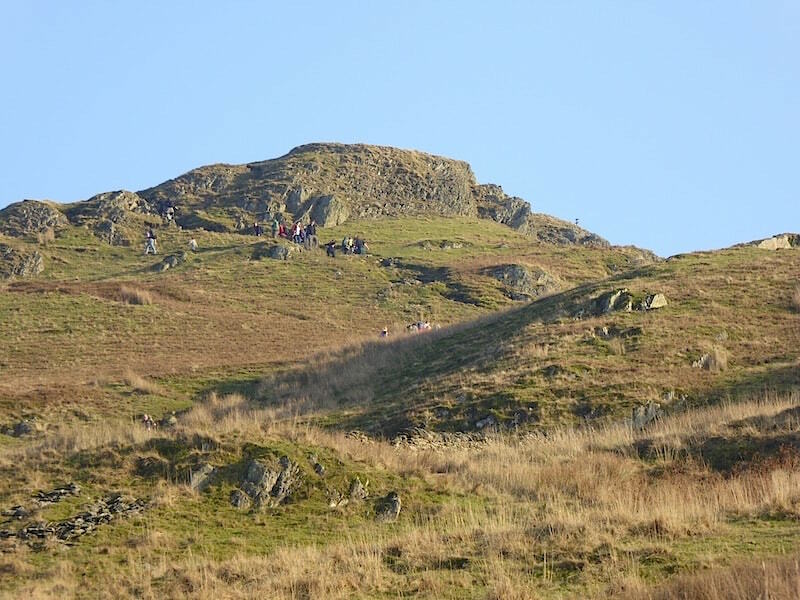 Wansfell Pike from our descent, and still plenty of people making their way up. 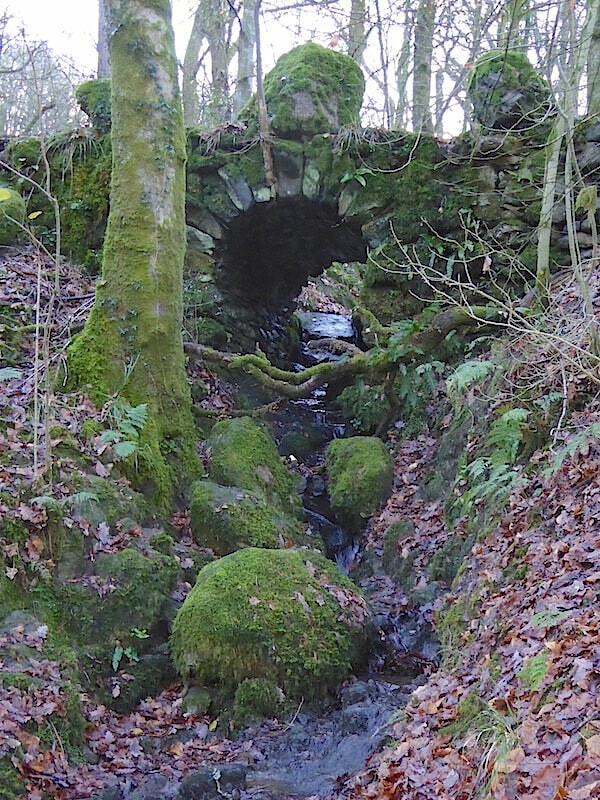 A beck crossing on the way down. We met a lady walker here who crossed the bridge coming towards us, stopped and looked up at the Pike behind us, then promptly turned round and went back down again. I did wonder why you would walk two thirds of the way up and then call it a day when the weather is as good as this. 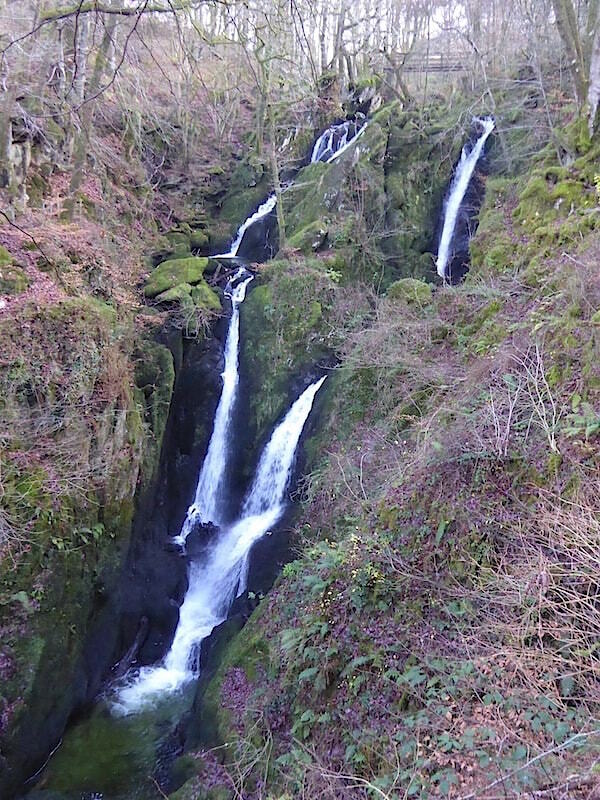 The light was much better when we returned to Stock Ghyll so a I took another couple of photos of the falls. This is part of the upper section …..
….. and this is part of the lower section. 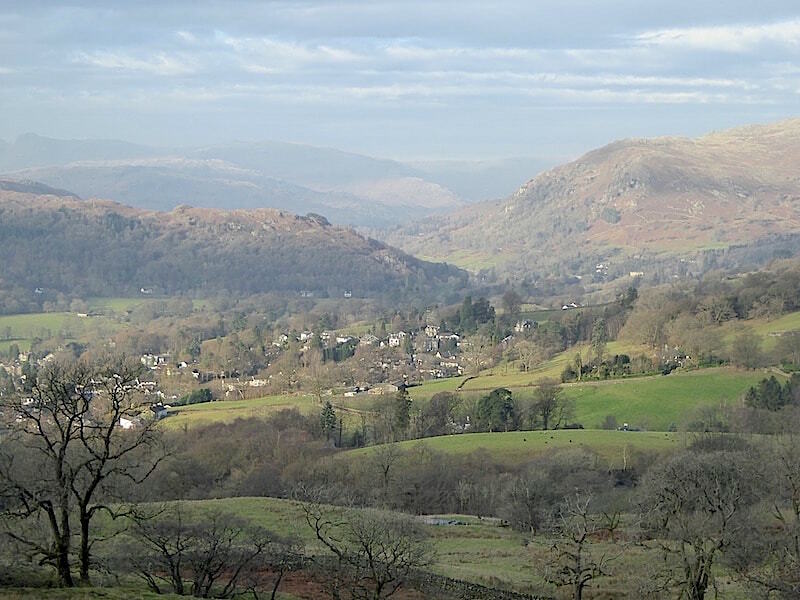 With that I put the camera away, we made our way back to Ambleside, threaded our way through the crowds again, fought our way out of the car park and headed off up the A591 and back home.